A 120-foot-high finger of earth extends north of St. Clares Cemetery in Clairton. Nearly one-third of a mile long, the rocky mound is the last diversion of Peters Creek before it straightens into a wide, flat plain in its last mile before the Monongahela River. 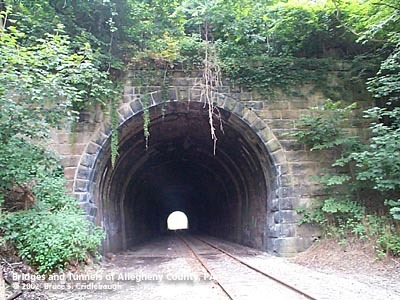 In 1893, the Pittsburgh, Virginia & Charleston Railroad began building what would become the PRR Peters Creek Branch. The railroad chose to follow the left descending bank of the creek, avoiding the jutting hill, but adding nearly a mile to the line. 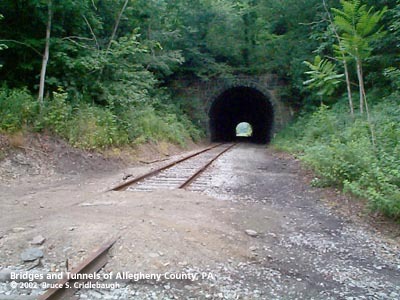 The surveyors for the West Side Belt Railroad found the Peters Creek valley a convenient route to bypass the previously claimed river-level routes. When this tunnel was opened in 1902, it was bored directly through the hill which had been a barrier to everything before. Jay Gould, with his son George Jay Gould, amassed numerous railroad companies in an effort to create a single corporation with a transcontinental system. The Wabash-Pittsburg Terminal Railroad in Pittsburgh was the Gould railroad, which was intended to provide access to the great industrial hub of Pittsburgh and act as the link between the western lines and seaports in Baltimore, MD. The West Side Belt Railroad was a piece of the patchwork system. The WSB picked up in Pittsburgh's West End, where the WPT RR stopped -- and by cutting through the South Hills, connected to rail lines on the Monongahela River. 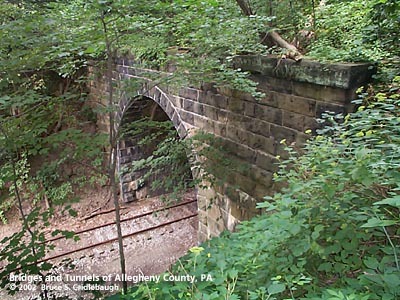 The technical difficulty of building a railroad into Pittsburgh where all of the "good" routes had been taken, the massive costs of the construction, and Gould's speculative business practices led to the bankruptcy of the Wabash line four years after it opened. The keystone at the top of each portal arch reads "1902." The interior of the tunnel has been reinforced with steel framework in several places. 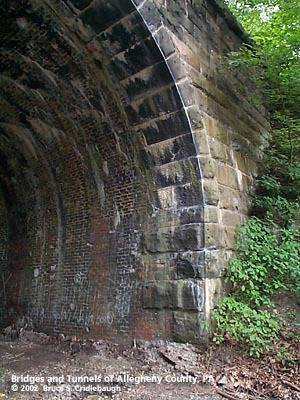 The eastern portal of the tunnel is visible at a distance of about 1000 feet from the deck of the high-level Ravensburg Bridge which connects the two halves of western Clairton on either side of Peters Creek. A huge slag dump nearly doubles the mass of the hill north of the tunnel. Benjamin Kuykendall [also Kirkendall, etc.] (1722-1789) is recognized as the earliest permanent European settler in the lower Peters Creek area. He is reported to have witnessed the 1754 march of Major Edward Hand away from Fort Pitt after surrendering the Point to the French. This was a time when the colonies of Virgina and Pennsylvania each laid claims to the area and prior to the legalization of settlements west of the Appalchian Mountains in 1763. Kuykendall and his family received the patent on the tract of land called "Ravensburg" from the Penns, yet he served as a justice in the courts of Yohogania County, Virginia. Tradition states "half-breed" Peter Chartiers, aka "Indian Peter" was the only native American to receive a land patent in the area. Both major streams which have watersheds partially on his lands, Peters Creek and Chartiers Creek, are named for the early settler.